Butterfly Pea Flowers | Nomad Spice Co.
Butterfly Pea Flower tea is starting to hit American shelves — and people just can’t get enough! the deep cobalt blue liquid changes color when an acid such as lemon or lime juice is added. Squeeze in some lemon or add in a bit of citrus juice, and the blue changes to purple. 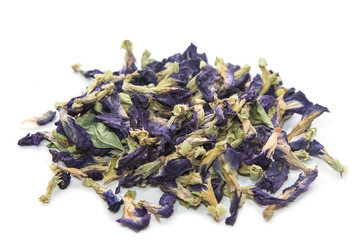 Its “mood ring-like” qualities have made Butterfly Pea Flower Tea a hit with anyone who enjoys a little whimsy in their life. Brewing Butterfly Pea Flower Tea is Easy!